Placid makes perfect, in a dreamy and luxurious retreat that's at one with its beautiful surroundings. How many other resorts can claim to be aligned with the stars? The airy white stucco buildings that seem to have grown organically from the jungle on the edge of the Caribbean were in fact crafted by local Maya masons, and oriented according to ancient astrological principles of harmony with their surroundings. Perhaps that's why Belmond Maroma feels so intrinsically right. Everything at this halcyon hideaway remains true to the spirit of its habitat. Thatched roofs and palapas of zacate screen terraces and beach chairs from the sun, and Mexican caftans take the place of robes in the guest rooms. Each bathtub in the rooms and suites is different, individually designed and set amid gleaming Mexican tiles. The inviting handmade hammocks are made of silk from the Yucatan. The creations in all three restaurants are sophisticated yet firmly rooted in local flavors and ingredients, from almond cucumber gazpacho with a dash of chili oil to grilled lobster tail with jalapeno-saffron sauce. The unbelievably soft beach and the azure Caribbean naturally lend themselves to every sort of activity from sunbathing and kayaking to snorkeling and scuba (the continent's second-longest barrier reef is just offshore). But perhaps even more satisfying are the pastimes that play to this area's idiosyncrasies: exploring the cenotes and nearby sites like Chichén Itza, learning the local vocabulary in the amusing Spanish classes Belmond Maroma offers, and—the crowning touch—cleansing body and spirit in the spa's traditional Temazcal sweat lodge. 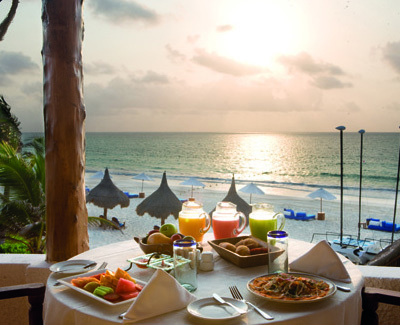 After such an experience, what more fitting way to end the day than dinner for two on the beach under the stars with which you're now aligned?